I had submitted a glimpse of my memory of Gandhi to the Herald a few days before his 141st Birth-anniversary but there was no mention of Gandhi in the Herald issue of Oct 2. 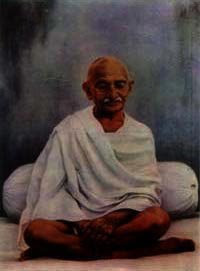 Albert Einstein said of Gandhi: "Generations to come, it may well be, will scarce believe that such a man as this one, ever in flesh and blood, walked upon this earth". At one time, the Herald translated an echo from the past on India-China relations: "Hindi Chini Bhai Bhai" as "INDIA CHINA BROTHER BROTHER". How pathetic! A meaningful translation would have been: "India and China are brothers or like brothers". On October 2, India and the world observed Gandhi's 141st birth anniversary and recalled his message of Truth, Nonviolence and Brotherhood of man. A lot has been said and written about Gandhi's life and work. His faith in nonviolence defined his struggle for political and social justice. He was convinced that a nonviolent mindset was the first step to achieving equality and ensuring human dignity. The method of peaceful resistance and civil disobedience that characterized his conduct of the Freedom struggle was anchored in his faith in the ultimate goodness of man - which to him was the Truth. He took a holistic view of the human struggle for survival and considered "political freedom" to be just one aspect of total liberation. That is why his definition of "Swaraj" meant selfgovernment with self-reliance and a sustainable future. He was averse to violence against nature and animals so much so that at one point he considered giving up Goat milk as part of his diet. As we mark his 141st birthday, we can only imagine the reach of his mind and his Pervasive love of humanity. Congratulations to the Gandhi Society of Calgary and the organizers of the Dinner Event and thanks to the eminent speakers.